What has Dave started? Steve C has now bought a mandolin! Now let me think about this ..... which REM song could possibly need a mandolin? Dave is now having saxophone lessons so there is now a very good chance that we will be able to incorporate this new instrument into our set. After the positive feedback about our two original songs, we have been encouraged to continue writing some of our own material and a few more are now in the pipeline! More gigs dates have been added to our calendar. Looks as though June is going to be a particularly busy month for us with five gigs already in the diary for that month! Work has now finished on our two original songs and were planning to debut these at The Lighthouse on 2nd March. There is a third song in there pipeline .... and, who knows, maybe more! This year is starting to look very busy for us! A wedding on 22nd of this month and bookings for three more gigs during the summer period. Oh ... and Dave is threatening to play sax on some of our songs ... very exciting times! Latest additions to our band diary for this year. An 80's Night charity gig in aid of St Luke's Hospice at Barnton Cricket Club on Saturday 9th February and two dates to play for the British Superbikes events at Oulton Park on 5th May and 7th September. As we resume band practices this month, we have now started working on two original songs plus a number of songs from our 'back catalogue' which Emma will sing. We hope to give these songs an airing at our next gig which will be on 2nd March. Spitting Feathers band would like to wish all our friends and supporters a Merry Christmas and a Happy New Year! We look forward to seeing you soon and hope that 2019 brings everything you wish for. We are getting excited about some ideas for original songs which Emma has come up with! Watch this space for further developments! We play a fantastic gig at the Portal Golf Club Autumn Charity Ball where we help tp raise money for St Luke's Hospice and the Leighton hospital Neo-Natal Unit. The dance floor was full all evening and we have had some really good feedback from the audience. We also say a fond farewell and big thank you to Shelagh who is guesting at her final gig with us before resuming work in her duo, Random. After depping for us several times during recent months, we are pleased to welcome Steve S to the band. Steve will play electro-acoustic guitar and will add both lead and harmony vocals to our mix. As a multi-instrumentalist, Steve can also stand in on bass guitar when needed. We now have a full line up! Our search is over! We would like to officially welcome Emma to the band as our new singer. She has started to work with us over the last few weeks and made her 'debut' appearance alongside Shelagh on 29th September. Emma will progressively take on more lead vocals and complete the handover with Shelagh by end November. Fantastic charity fundraiser evening at The Stronghold on Saturday 29th enjoyed by friends and families. Lots of dancing, great fun and, most importantly, we raised £400 for PettyPool Vocational College. 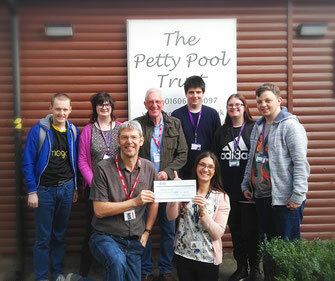 Here is Chris presenting our cheque to Lois Bateman, the PettyPool Fundraiser. Thanks to everyone who helped and to all our kind sponsors including ODEON Cinemas, Kanya Bistro and Bar, Lucky Petes Chippy, Define Food and Wine, Chef & Brewer, Shelagh Jones, Cheryl Booth, Linda at Choc affair, Julie Bone, Chris Bone and Dave Gowler We would also like to thank The Stronghold Weaverham Church for providing the venue. We play Truckfest on 15th September with Lisa kindly standing in on vocals. We were well received by the audience but the event was rather spoilt by a couple of guys who insisted on repeatedly exposing themselves right in front the stage with security just watching on. A busy month for the band, starting with a brilliant gig at The Lord Eldon in Knutsford on Saturday 1st. Best audience response we have had at this venue and the place was buzzing! Our search for a replacement singer continues whilst Shelagh helps us out again on Band Holiday Monday at the Northwich Festival where we share the bill with Harley'N'Dutch, Boneyard Alley and the ukulele band! Pauline has left the band and we are currently recruiting for a replacement female lead singer. in the meantime, Shelagh had agreed to support the band in a deputising role. We have been asked to play at The Leigh Arms 2018 charity Music Festival so an extra gig date has been added for Saturday 28th July. We have a 60 minute slot and will be on stage at 5.50pm. This is really exciting news and we are looking forward to playing for a big audience. We went on 'tour' to Durham to play at Dave's sister's 60th birthday party and Steven drove the van which we had hired. Loading and unloading the van made us realise just how much sound and lighting equipment we have! Our best gig to date at The Lord Eldon in Knutsford on 30th June. Great audience reaction and we had people up dancing for much of the time. Lots of nice feedback including compliments from the management who are keen to get our 2019 dates booked into their diary. We started playing our 45-minute set at the Northwich Party at Park today and all went well until a power failure brought an end to proceedings in the middle of our sixth song. We struggled on as best we could with acoustic versions of What's Up and Breakfast at Tiffany's but the power didn't return and we we told that the remainder of the set would have to be abandoned. First time this has ever happened to us and hope for more luck if we are invited back again next year! Our trailer had its first outing at Lymm OP Cricket Club where we played a really good gig on 25th May. Steve Salisbury also made a very successful debut at Hoghton Tower gig on 3rd June deputising for Steve C on bass. We had very positive feedback from both gigs! We are investing! A gazebo for outdoor performances and a box trailer to transport our sound and lighting equipment to and from gigs. Look out for the trailer being towed locally by Steven's red Landrover Defender! By playing two sets at the Fun4Freddie charity fundraiser at Winnington Rec on 6th May, we were delighted help the amazing Billie Pickstock to raise over £4,000 to pay for Freddie's next course of therapy. What a result! We have been very fortunate to secure the services of Steve Salisbury to stand in for Steve C for the gig at Hoghton Tower in June. Steve S will also be dipping for Dave at a gig in September. He is rapidly becoming our 'super sub'. Brilliant gig at Blakemere Village on 21st. Great weather, superb facilities and a very appreciative audience. Hope to invited back for future events at the venue! We have been invited to play a gig at Portal Golf Club in July. This will be a charity fund-raiser in aid of St Luke's Hospice and will be our first of the year. This will be our second visit to Portal. We are planning to add a number of new songs to our set for Julie's Birthday Party on 31st March. We have included some great vocal harmonies on some of these songs and are looking forward to performing them live for the first time! 6 more new songs in the pipeline for gigs this Spring ...... Steven may make a special appearance on stage for one of these so watch this space! Steven has bought himself a guitar and has started learning some of our songs. He threatens to join us on stage for one or two number at gigs this year ... who will babysit the sound desk whilst he is 'strutting his stuff'? We are now working on the next batch of new songs which we will introduce into our set list from March onwards. Six new songs at present ... and still counting! We would like to wish all our friends and supporters a Merry Christmas and Happy New Year from the band! Last gig of the year at The Lord Eldon. A very cold night with a small but enthusiastic audience. Pauline's third gig with us and we tried out about six new songs and all seemed to be well-received. Looking forward to returning next year for three more gigs at this venue. After performing really well with us during the October gigs, we are delighted to announce that Pauline has now joined the band as our new female lead singer. We look forward to a great future with Pauline as part of the team! Played two gigs this month and Pauline, the other female singer that we are currently auditioning, sang with us at both of these gigs. The first was at The Lord Eldon in Knutsford on 7th October, followed by our non-stop two hour performance at the Hospfest charity event in Tarporley where we helped to raise more than £1,500 in much needed funding for Tarporley Hospital. Fantastic gig at Oulton Park last night for the British Superbikes event! The audience was really rocking and there was a great party atmosphere. Hope we get the opportunity to play at this event again! Hot off the press! At short notice, we have been asked to play at Oulton Park for the British Superbikes evening event on Friday 15th September and Nzera will be having her second gig with us. We are now regulars at Oulton Park but this will be our first time at this big event. We are really up for it and it should be a great gig! Now gearing up for the gig at Tatton Park on Sunday 10th September. For this gig, we are taking a large marquee just in case it rains! Nzera, one of the female vocalists who has auditioned with us recently will be singing with us at this gig so we hope we get a good audience. Busy time this month with three gigs - Oulton Park MiniFest on 19th August, a Charity Party at Rostherne on Saturday 26th and then our Bank Holiday Monday gig at the Northwich Festival on 28th. Lisa has kindly agreed to stand in on vocals for the gigs on 26th and 28th. Unfortunately Emma has had to leave the band due to family commitments so we are auditioning for a replacement female singer. Planning to meet several people over the coming weeks. We play two gigs this month. The first is at the Hartford 'Picnic in the Park' on 10th July followed by a return visit to Lymm Cricket Club on Friday 14th July. Hope to get some good band photos from these events as we urgently need to design and print a new set of flyers including Emma and Steve. We play our first gig with Steve on bass. We are well-received by the audience at Hebden Green School and, as a result, we get another gig enquiry for a private function. Onwards and upwards from here! Another great night at Oulton Park on 20th May but in some ways a little sad because it was Paul's final gig with us on bass. Hundreds of people crowded into the marquee and we had quite a challenge to end the performance and get offstage when it reached the curfew time of 11.00pm. Hope to be invited back again in 2018. Great news. We have just received confirmation that Lymm Cricket Club would like as to play another gig at their clubhouse on 14th July. It was a great atmosphere last year and should be another really good night! We have added 6 more songs to our repertoire and will be giving these a first outing at the Hebden Green School fund-raiser gig on 19th May and the Oulton Park gig on 20th May. We think that one of the new songs will be particularly appropriate for the race-going audience on 20th! Two gigs this month - The Lord Eldon in Knutsford on 4th and a charity fund=raiser at Tarporley Community Centre on 18th - provided the opportunity to try out a number of new songs as well as the normal 'crowd- pleasers'. Our first gig at The Railway in Nantwich. Emma sang well and the audience seemed to enjoy our set. Hope to be invited back later this year! We begin working in detail on the repertoire, identifying those existing songs which Emma is comfortable to sing and earmarking additional songs to practice during the coming weeks. Spitting Feathers band would like to wish a Merry Christmas and Happy New Year to all friends and supporters. Here's hoping for a great 2017! We start rehearsing with Emma and begin to get to know each other's music preferences. Emma starts to think about the new songs that she would like to bring to the repertoire. On 19th November, we played a fantastic gig at the Spitting Feathers Brewery Brewbarn event as a four-piece. Our 90-minute set really got the place bouncing and we had very positive feedback afterwards from the audience! Auditions are held and we select Emma to join the band to replace Gosia. We have advertised for a singer to replace Gosia and will be holding auditions as soon as possible. In the circumstances, we will play the November gig as a four-piece. Gosia has announced that, because of child-minding issues, she will have to leave the band. Sad news but we have had two very good years together as a ine-up and we wish Gosia and the girls all the best for the future. Now completed four of our five public gigs for August and September. Hard work but well worth all the effort. All gigs very different but each has been a success and will hopefully result in return visits next year. Dave has invested in a radio headset mic which has featured in the last two gigs meaning that Dave is now dancing about alongside Gosia whilst he is singing! We have just had confirmation that we have been invited back to play again at Oulton Park for the British Touring Cars event on 20th may 2017. Always a highlight of our gig calendar! Just a quick update for those of you planning to come along to our gig at The Northwich Festival at Moss farm on Bank Holiday Monday afternoon, 29th August. We will be the closing act for the festival and will be playing in the main marquee from about 4.00pm for at least 60 minutes ..... and maybe longer if the crowd is screaming for more! Do come and join in the fun! Brilliant gig at Lymm Cricket Club last Friday evening despite the Club's power supply tripping out for a few minutes during our second set! It is a great Club with a nice atmosphere and it seems that Chris is a 'cricketing legend' there. Lisa did very well standing in for Gosia who is on holiday in Poland. We hope to be invited back to play there again. Yet another gig has been added to our band calendar. On Saturday 3rd September, we will be playing for the first time at The Lord Eldon pub in Knutsford which is well-known locally for its live music evenings. This is one we are really looking forward to! Many thanks to Bob from Tourguide who put us in touch with the pub. Another gig added to our schedule!. We will be playing at the Northwich Festival on the afternoon of Bank Holiday Monday, 29th August which is the family day at the event. We will be playing on the main stage in the marquee at Moss Farm in Northwich. Should be a great gig! Whilst Dave G has been enjoying the sunshine with the family in Bali, we have successfully played two really good gigs - in Knutsford and at Nunsmere Hall. Many thanks to our very able keyboard deputies, Sophie and Bob and also thanks to Dave R who stood in for Paul on bass in Knutsford and to Kemper who stood in on vocals for Dave G at Nunsmere. It may not have escaped the notice of 'real ale' fans that we share our band name with a great local micro brewery based at Waverton near Chester. For the first time, we are teaming up by playing a gig at the Spitting Feathers brewery's Brewbarn event on Saturday 19th November and we are very much looking forward to this event! We are delighted that new bookings are coming in steadily for the next few months. We have been asked to play at a school Party in the Park event at Knutsford on Saturday 9th July and also at a Lymm Cricket Club Social Evening event on Friday 19th August. We have just had confirmation that we have been invited back to play again for the Knutsford Promenades 2016. We will be playing outdoors in the town on the afternoon of Saturday 10th September and a large crowd is expected. It should be a great event! Another new booking! This is for a garden party to be held by a Knutsford Pre-School group which is celebrating its 20-year anniversary this summer. it will be an outdoor event held on Saturday 18th June and we are really looking forwards to it! New date added to calendar. On 1st April we will be playing at a private birthday party at The Lighthouse in Weaverham. This is our third gig at this venue and it should be great one! Dave is going use use his new Yamaha synthesiser so listen out for some funky keys! New booking for us to play at the prestigious Nunsmere Hall on 13th July for the Petty Pool College Annual Proms. The event will be attended by students, parents and staff and, for many of the students, it will be their first experience of a live music event. We are really looking forward to this gig! Brilliant gig for the Northwich Soroptimists at Norley Village Hall. Packed full of people (some even turned away at the door!) and a great atmosphere with people up dancing throughout our two sets. Great night! We were delighted to receive this letter from The Russett School thanking us for our donation of £300 following the successful band night on 14th November. Spitting Feathers would like to wish all our customers, supporters, friends and their families a very happy Christmas and a happy and prosperous 2016! We were delighted to hand over a cheque to The Russett School for £300 as the proceeds from our fund-raising gig at The Lighthouse on 14th November. The money will go towards providing playground equipment for the children. We hope do more fund-raising for school during 2016. Fantastic gig at The Lighthouse on 14th November. Everyone enjoyed the evening and we were successful in raising money for The Russett School! Thank you to those who attended and donated so generously. Five new songs added to the set list for this coming Saturday's gig at The Lighthouse and tickets are selling well. We want to raise as much money as we can so that The Russett School can buy playground equipment. Should be a great atmosphere and a enjoyable evening! Today marks the first anniversary of Gosia joining the band! We are really excited as this is the longest period in the history of Spitting Feathers without a line-up change. Here's to the future .... and to our next gig at The Lighthouse in Weaverham on 14th November which will be in aid of The Russett School! Fantastic gig at St John's Church hall last Saturday. Lots of dancing and positive feedback from the organisers and guests. Look out for our short highlights video coming soon. Hope we are asked to play at this venue again! We have put together a short video of our Tarporley set (now on our Music page) which shows a lot of enthusiastic dancing and we hope really captures the fantastic atmosphere on the night. Bill & Lin, from Tarporley U3A, have forwarded the link to our video to all 300 Tarporley U3A members and already we have had a lots of hits on YouTube and also on our website! Great news! Two new gigs added to the band diary. on 3rd October, we will be taking the stage at a community 'hot pot and band night' at St John's Church Hall in Sandiway. On 14th November, we will be playing at a band night and charity fund-raiser at The Lighthouse in Weaverham. Looking forward to both events! Great gig for Tarporley U3A last night. Packed venue, good atmosphere and lots of dancing. Tom Piper hog roast company also did an excellent job with the meal. Hope we get the opportunity to play there again! Hot off the press! New gig date added. We will be playing for the Tarporley U3A Summer Party at the Tarporley Community Centre on Saturday evening, 29th August 2015. Lots of live music for dancing ... and even a hog roast Looking forward to it already! We had a great time playing a live set at the Knutsford Promenades. Appreciative crowd, great support from the stage and sound crew at Event Buddha and, as you will see from watching the video on our 'Music' page, even a smoke machine and light show! Hope we get the opportunity to play in Knutsford again soon! As a result of the positive feedback received from our recent gig, we have been asked to play again at Oulton Park in 2016!! Fantastic night playing the Oulton Park gig on Saturday. Good crowd, great atmosphere ... and a lot of fun. We shared a packed marquee with over 250 people who were having a brilliant time. We were even 'supported' by a group of guys playing inflatable guitars. We had a ball and can't wait to play there again!! Really good gig at Portal Premier Golf Club on Saturday evening. Plenty of people dancing and positive feedback from Morris Legge the Club President. They liked us and have suggested that they will ask us to play again in the future. great news! Brilliant gig at The Lighthouse, Weaverham last Friday night. Great audience who filled the dance floor for most of the evening. Have had many positive comments from the organiser and those present ... and, as a result, a some new gig enquiries! Just had confirmation that we will be playing at Portal Premier Golf Club, Tarporley on Saturday evening 23rd May at an event to mark their 25th Anniversary. There should be a great party atmosphere and we are really looking forward to playing a 90-minute set! Dave just happened to mention casually at a recent band practice that he used to play keyboards for Andy Bell of Erasure. We certainly didn't know we had such a 'rock legend' in our midst. That would account for the rather funky keyboard solos that Dave has been adding into our set during the last few weeks! Busily working on about 10-12 new songs in readiness of our first planned gig this year in April. Most of the new material is contemporary and many will feature Gosia on lead vocals. Songs covered range from numbers by Katy Perry and Jessie J to One Republic and Lawson - quite an eclectic mix all good for dancing!. Three new dates in the gig diary for this year including playing for the first time at Oulton Park for the British Touring Cars evening event in June. Please check out our Gigs page for further details of these gigs. We played for the first time with our full line up at Moulton Drama Group's Christmas Party on 13th December. Really good gig with an appreciative audience ... and even some dancing! Gosia sang and performed well at her first gig with us and also played rhythm guitar on a number of songs which helped to provide more depth to the overall sound. Well done (as usual) to Steven getting a great sound balance for the show. Our thanks to Moulton Drama Group for inviting us to play and also to Kanya, the outside caterers, who provided a fantastic meal before we started our set. 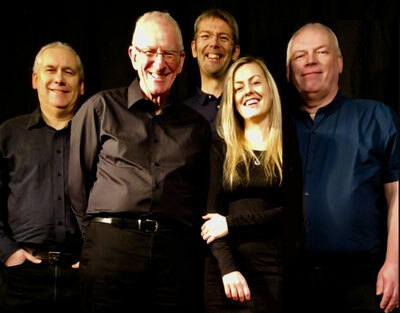 After several months of rehearsals, Spitting Feathers plays its first gig with the new line-up. About 50 friends and family enjoy a varied set at Hartford Village Hall and the audience feedback is very positive. Our new vocalist, Gosia, is unavailable to join us for this gig but we we fortunate that Lisa Bone was able to do an excellent 'guest spot' with us singing Domino and Firework. Potential new band line-up meets together in Sandiway for the first time. A mixture of excitement and some nervousness. WIll everyone get on well together and can things progress from here? ....... watch this space for the next update!